Your dorm bedding is about more than your Twin XL Comforter and dorm sheets! Dorm bedrests are an important part of college dorm bedding, too! When you're studying, reading, or watching TV late at night, you're not going to be able to go to the library or a coffee shop. You're also not going to want to sit in an uncomfortable dorm desk chair hovered over your desk like you were in class all day. You want (and need!) comfort! Look no further than our super comfortable Firm Campus Bedrest in Tan! Here at DormCo, we've got your back and know that you need comfort and relaxation after stressful days. Our dorm bedrest will provide you with firm, comfy support so you can sit up in bed and relax or study. 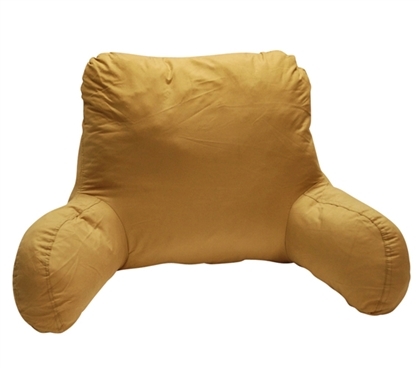 Our Campus Bedrest in Tan is made of Microfiber which means it is also super soft! It will be a soft, comfy dorm bedrest that can easily turn your dorm bed into seating. Plus, our dorm bedrest is convenient soft dorm seating that can be easily moved wherever you need it to be! If you have friends over and one has to sit on the floor, give them a little bit of comfort with your Firm Campus Bedrest! Since this dorm bedrest is in a neutral Tan color, it will also go great with your dorm room decor and match your dorm bedding!